Every candidate at an election shall either by himself or by his Election Agent keep a separate and correct account of all expenditure in connection with the election incurred or authorized by him or by his Election Agent between the date of the order calling the election and the date of declaration of the result thereof, both dates inclusive within the period of thirty days from the date of declaration of the result. The account shall contain such particulars as are specified in Rule 67. The total of the said expenditure shall not exceed such amount as may be Notified by the SCEA. Every contesting candidate at an election shall, lodge with the District Co-operative Election Officer through the Returning Officer an account of his Election expenses within the time and in the manner in Rule 67.
has no good reason or justification for the failure, the District Co-operative Election Officer shall, by order published, in the Official Gazette, declare him to be disqualified for being elected as, and for being, a member of the committee of any society, and any such person shall be disqualified for a period of three years from the date of the order. the name and address of the person to whom the amount outstanding is payable. All vouchers shall be lodged along with the account of election expenses, arranged according to the date of payment and serially numbered by the candidate or his Election Agent and such serial numbers shall be entered in the account under item (f) of sub-rule (1). It shall not be necessary to give the particulars mentioned in item (c) of sub-rule (1) in regard to items of expenditure for which vouchers have not been obtained. the time and place at which such account can be inspected. On receipt of the declaration under Rule 32 or of the election results under Rule 64, the SCEA or the District Co-operative Election Officer shall publish within two days the names of all elected committee members by causing a list of such names together with their permanent addresses and the names of constituencies from which they are elected, to be posted on the notice board or at any prominent place in his office. The SCEA or the District Co-operative Election Officer shall send a list of all the elected committee members to the society and to the Registrar. The deposit made under Rule 23 shall either be returned to the person making it his representative heir or be forfeited to the Election Fund. Except in cases hereinafter mentioned in this rule, deposit shall be returned as soon as practicable after result of the election is declared. If the candidate is not-shown in the list of contesting candidates, or he dies before the commencement of the poll, the deposit shall be returned as soon as practicable after the publication of the list or after his death, as the case may be. Subject to the provisions of sub-rule (3), the deposit shall be forfeited to the Election Fund, if at an election, where a poll has been taken, the candidate is not elected and the number of valid votes polled by him does not exceed one-tenth of the total number of valid votes polled by all the candidates or, in the case of election of more than one member at the election one-tenth of the number of valid votes, so polled divided by the number of members to be elected. The Returning Officer shall keep in custody the packets referred to in Rule 51 and all other papers relating to the elections up to 6 months from the date of declaration of result or in the case of election dispute as directed by the Court. the packets of marked copies of the voters list, shall not be opened and their contents shall not be inspected by, or produced before, any person or authority, except under the order of the Court. All other papers relating to the election shall be open to public inspection. The packets referred to in Rule 72 shall be retained for a period of six months and shall thereafter be destroyed, subject to any direction to the contrary given by the SCEA or a Court. All other papers relating to the election shall be retained until the termination of the election for the constituency to which they relate and shall thereafter be destroyed subject to any direction to the contrary given by the Commissioner or a court or other competent authority. These societies shall inform before one hundred eighty days about expiry of term of committee to the Taluka or Ward Co-operative Election Officer with four copies of list of active members. 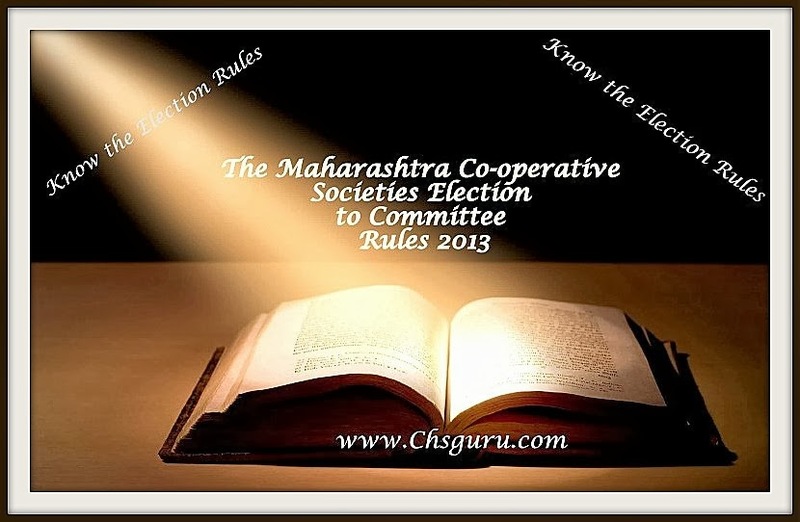 The Taluka or Ward Co-operative Election Officer shall appoint a returning officer from office of the Co-operative department or a panel approved by the SCEA and the returning officer shall prepare an election programme with the approval of Taluka or Ward Co-operative Election Officer at the earliest. Publication of the Election programme and provisional voter list. Next date to the day at which Taluka/ Ward Co-operative Election Officer has approved the election programme. Inviting claims and objections on provisional voter list. Within a period of 5 days from the date of publication of provisional voter list. Decisions on claims and objections on provisional voter list. Within 2 days from the last date of making claims and objections on provisional voter list. Publication of the Final voter list. Next date to the day fixed for decisions on claims and objections on provisional voter list. Last date for making nominations. 5 days from the date of publication of the final voter list. Publication of the list of nominations. On the last date and after the expiry of the time for nomination. Next date of the last date for making nomination. Date of publication of list of valid nominations. Next day after the date of completion of scrutiny of nominations. Date by which candidature may be withdrawn. After 15 days from the date of publication of valid nominations. Date of publication of Final List of contesting candidates and allotment of symbols. The date next succeeding the last date fixed for withdrawal of candidature. (The place and time shall be fixed by the Returning Officer). Date and time during which and the place at which the poll shall be taken. Minimum 5 days after the date of withdrawal of candidature. Date time and place for counting Votes. Immediately after polling is over. Date of declaration of results. Immediately after counting of votes is over. The provision of Rule 20 to 74 shall mutatis mutandis apply for conduct of election of such societies. (a) If the nomination is rejected by the Returning Officer, the candidate may prefer an appeal to Registrar within a period of three days from the date of rejection of nomination. Registrar shall dispose of such appeal within ten days of the date of receipt of such appeal. The Returning Officer shall submit the result to The Taluka Co-operative Election Officer within two days from the date fixed for declaration of the result. The Taluka or Ward Co-operative Election Officer shall publish a notification of elected candidate within a period of three days after receiving the result of election and give direction to Returning officer to choose office bearer within the period of ten days. Election of these types of societies shall be conducted according to procedure laid down in these rules except the time and date prescribed in this rule. The society shall prepare its list of voters and submit a copy thereof to the Taluka or Ward Co-operative Election Officer within seven days from the date of preparation. Provided that, the General Body of the society by resolution may submit requisition to the Taluka or Ward Co-operative Election Officer, to hold the election as prescribed in Rule 75, the Taluka or Ward Co-operative Election Officer shall proceed for the election as per procedure laid down Rule 75. Provided that, in case of failure of the Special General Body meeting called for the purpose to choose member of the committee for any reason, the person appointed shall report to the SCEA or, District Co-operative Election Officer or, the Taluka or Ward Co-operative Election Officer, as the case may be, to conduct the election as prescribed in the rules 76. Provided also that, the person appointed for the election purpose shall have no right to caste a vote in any circumstances. (2) The person appointed for election Purpose shall attend the meeting and report the SCEA within two days of the meeting held for the purpose. As soon as the members of the committee are elected, the election of office bearers of any such society shall be held within the period of fifteen days from the declaration of the result as provided in its by-laws. The meeting of the committee for this purpose shall be presided over by officer authorized by the SCEA. No election shall be called in question, except by an election petition presented to the Co-operative court as laid down in section 91.